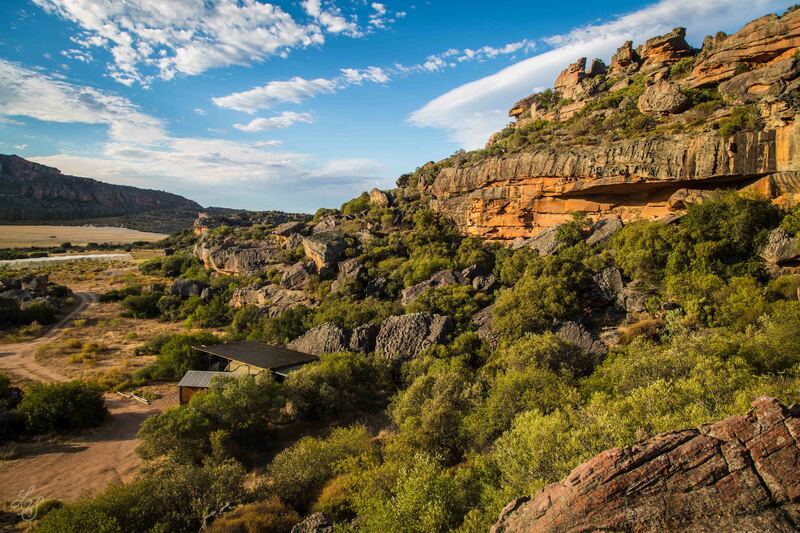 There are many fantastic spots in Cederberg where you can go camping, hiking and bouldering, but there are only few gems, hidden and not full of families and tourists. One of these is De Pakhuys, a quiet and special place in the Cederberg area, just on the right side of Clainwilliam, beyond the Pakhuys Pass. To reach the place you need to know where you are going. Despite the fact it is tarred till 5kms to the place, then you are going to enter inside crop fields and you are going to go around there for a while before finding the campsite. Moreover, if possible, don’t do this at night, otherwise you’ll get lost for sure (like we did). At the campsite you will be able either to camp with your tent or to rent one of the few cottages available. The best things is that you are not going to have neighbours, but you are going to be you and the nature. And it’s pet friendly! Yep, that was our spot. Nice eh? You can do a whole bunch of activities there: from relaxing under a tree to hiking and bouldering. Anyway, this post is about a hike, very short but worth it. It’s a 30 minutes hike departing from the furthest side of the camp and leading to a little spot where you can bath and shower under some wonderful waterfalls. This is the spot – bring water! Indeed you are going to stay there and swim a bit around. Hence bring all the necessary to have a nice time: remember, there is no shadow. Water is deep enough to swim and even dive a bit nearby the waterfalls (bottom reach 2 meters) but do not attempt diving without checking before. The spot is really narrow. You can also start to play with your camera and try different photo techniques. Different speed and different iso makes a huge difference. Ah, and better if you have a travelling buddy with you. You can maybe “borrow” one from the owners. Actually this guy decided to come with us for a walk and we couldn’t say no. He knew the path way better than we did. Last but not least. your adventure there shouldn’t conclude without a tasty braai. Bring wood, meat and wine and get your hands dirty!